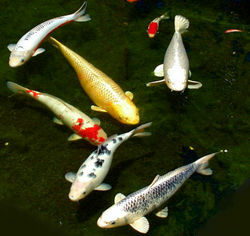 A group of several varieties of Koi. Koi ( Japanese: 鯉, koi) are ornamental domesticated varieties of the common carp Cyprinus carpio. They are very closely related to goldfish, and in fact the style of breeding and ornamentation has become very similar, probably through the efforts of Japanese breeders to emulate goldfish, but they are not goldfish.If a person travels to Japan and tells his or her friends that he or she loves koi, their friends might invite that person to eat the dull gray fish that inhabits the waters of the islands, as in Japanese, the word koi simply means "carp". 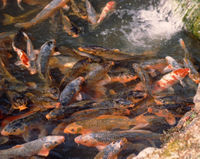 If a person tells a group of people that he or she appreciates Nishikigoi (錦鯉: " brocaded carp"), the group may lead the person and their camera to the pond in the garden. This article is about Nishikigoi, and uses the English word koi to refer to the colorful fish.While a Chinese book of the Western Jin Dynasty ( 4th century) mentions carp with various colors, Koi breeding is generally thought to have begun during the 19th century in the Niigata prefecture of Japan. Farmers working the rice fields would notice that some carp would be more brightly colored than others, capture them, and raise them (when normally the brighter colors would doom the fish to be more likely eaten by birds and other predators). By the 20th century, a number of colour patterns had been established, most notably the red-and-white Kohaku. 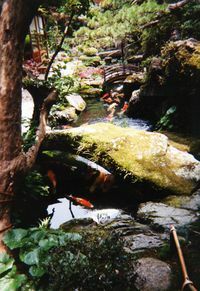 The outside world did not become aware of the degree of development until 1914, when the Niigata Koi were exhibited in the annual exposition in Tokyo. Some of them were also presented to Crown Prince Hirohito. At that point, interest in Koi exploded throughout Japan. The Hobby of keeping Koi spread worldwide after plastic bags and shipping of Koi became both fast and safe for the fish. These factors enabled Koi to be shipped worldwide with low mortality rates. Koi are now commonly sold in most pet stores, with higher-quality fish available from specialist dealers.Koi varieties are distinguished by coloration, patterning, and scalation. Butterfly Koi, Longfin Koi, or Dragon Carp developed in the 1980s and notable for their long and flowing fins, are actually hybrids with Asian carp, and not considered true Nishikigoi. This Koi lives with several others in the courtyard of City Hall in St. Augustine, Florida. Koi have many different colors. Some of the major colors are: white, black, red, blue, green, yellow, purple and cream. Koi can also have a metallic sheen to the scales, this Koi is called Gin Rin (pron. Geen Leen). There is also a scaleless version for nearly every Koi and Japanese breeders call it Doitsu (German). The breeders created the scaleless versions by crossbreeding the Nishikigoi with German mirrored carp. 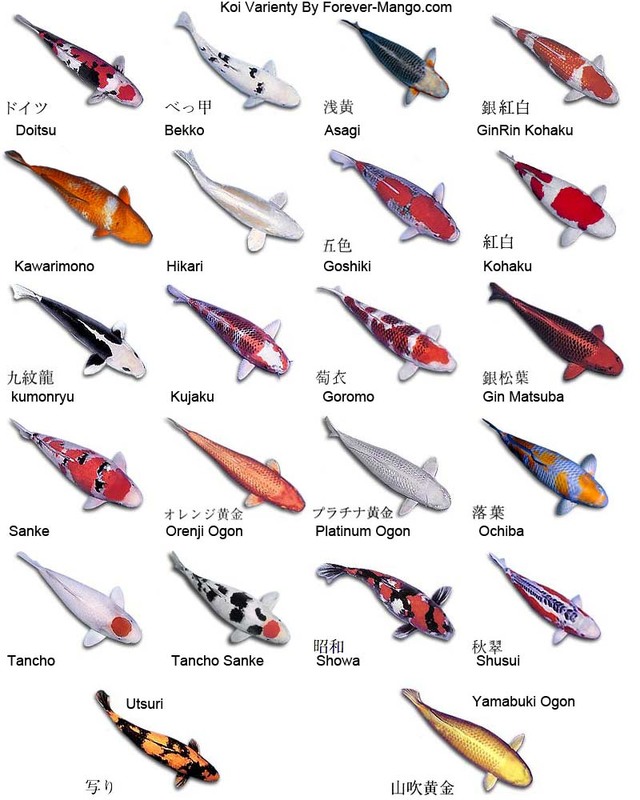 Some Doitsu Koi have large scales on their sides and others do not have any scales at all.While possible variations are limitless, breeders have identified and named a number of specific categories. The most popular category is Gosanke. The Gosanke category is made up of the Kohaku, Taisho Sanshoku, and Showa Sanshoku varieties. The Japanese breeders have many generations of knowledge and experience when it comes to breeding and raising Nishikigoi (pronounced nee-shee-kee-goy). They know which ones will be worth a couple hundred dollars and which ones will be a couple hundred thousand dollars. 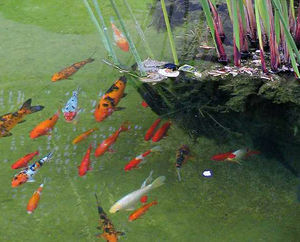 Six koi (and one goldfish) living in a private outdoor pond in San Jose, California. KinGinRin - Koi with shiny scales "Gold Silver Scales"
Traditional Japanese garden with koi. 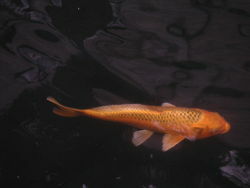 The common carp is a hardy fish, and koi retain that durability. They can be kept in anything from small containers to large outdoor ponds (see water garden). Although Koi can grow to 90 cm (3 ft) if you have one with a good bloodline, the traditional indoor aquarium is less desirable than a round plastic tub. Koi are cold water fish, so it's advisable to have a meter or more of depth in areas of the world that become warm during the summer. In areas that get harsh winters, it is a good idea to have a pond that is a minimum of 1.5 meters (4 1/2 feet) deep so that it won't freeze solid. It is also a good idea to keep a space open with a bubbler and a horse trough heater.Koi's bright colors put them at a severe disadvantage against predators; a Kohaku looks like a visual dinner bell against the dark green of a pond. Herons, kingfishers, raccoons, cats, foxes, and badgers are all capable of emptying a pond of its fish. A well-designed outdoor pond will have areas too deep for herons to stand in, overhangs high enough above the water that mammals can't reach in, and shade trees overhead to block the view of aerial passersby. It may prove necessary to string nets or wires above the surface.The pond should include a pump and filtration system to keep the water clear.Koi are bottom-feeders, so koi food is not only nutritionally balanced, but designed to float so as to encourage them to come to the surface. When they are eating, you can also check for parasites and ulcers. Koi will recognize the person feeding them and gather around at dinnertime. They can even be trained to take the food from one's hand. In the winter their digestive system slows nearly to a halt, and they eat very little, perhaps no more than nibbles of algae from the bottom, and their appetite won't come back until the water warms up in the spring. If kept properly, koi can live about 30-35 years. Some have been purportedly known to live up to 200 years.